Whether you’re on holiday or living abroad, you can watch PBS outside the US. In order to do so, you’ll need a suitable VPN. 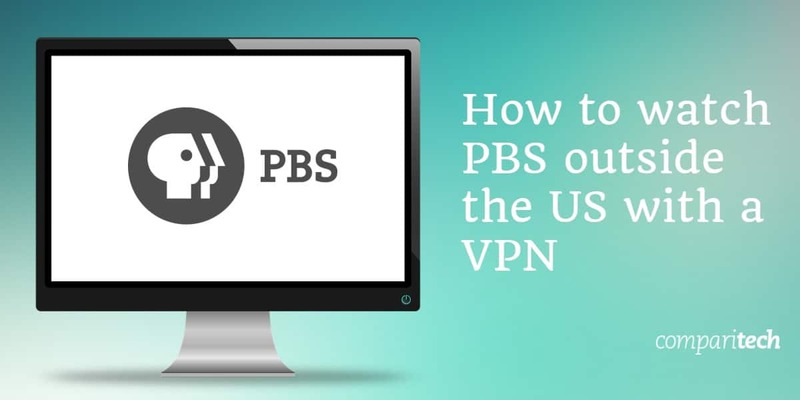 We’ll show you how to watch PBS outside the US and the best VPNs to do so. “We’re sorry, but this video is not available in your region due to rights restrictions”. This isn’t an uncommon issue when it comes to streaming content abroad. Unfortunately, the same issues can occur with popular streaming services such as Netflix, BBC iPlayer and Amazon Prime Video. It’s actually very easy to bypass such restrictions with a Virtual Private Network (VPN). A VPN allows you to connect to a server in another country (such as the US). In doing so, you will be assigned a different IP address, making it appear as though you’re browsing the web from another location. Your internet traffic is then encrypted and routed through the VPN server chosen, allowing you to unblock geo-restricted websites and services such as PBS. ExpressVPN: Fast servers in the US and worldwide. Able to unblock PBS, Netflix and Amazon Prime Video. 24/7 live chat support and strong security with encryption. NordVPN: Huge number of servers in the US (1,800+). Fast for streaming PBS, Netflix and more. Use on up to 6 devices. Live chat support and a no logs policy. CyberGhost: Plenty of US-based servers for unblocking PBS. Connect up to 7 devices. Easy-to-use apps and secure with encryption and a no logs policy. PrivateVPN: Fast VPN service that unblocks PBS, Netflix and Amazon Prime Video. Connect up to 6 devices simultaneously. User-friendly and secure with encryption. Sign up with a VPN service with servers in the US – we particularly recommend ExpressVPN. Download the VPN software, making sure to choose the correct version for your device. Open the VPN app (or browser extension, if available) and select a server in the US. Choose a PBS or PBS Kids show, which should now be unblocked! While we’ve successfully unblocked PBS with all of the VPNs listed, your experience may differ. If content is still restricted, try clearing your browser’s cookies or connect to another server. If all else fails, you may want to contact your VPN’s customer support. ExpressVPN is the most reliable VPN we’ve found. Not only does it unblock PBS outside the US, it also unblocks everything from Netflix to Amazon Prime Video. Just as important, it offers fast and consistent servers for stress-free streaming without buffering or lag. ExpressVPN has over 3,000 servers in 94 countries, making it one of the biggest VPNs on the market today. What’s more, it has servers in multiple US cities including New York and Washington. What makes ExpressVPN such a popular choice is its accessibility. It offers user-friendly apps for a wide range of operating systems while the browser extensions add to the overall ease of use. It’s worth knowing that ExpressVPN provides excellent customer support, available 24/7 via live chat. If you have any doubts, you can rest assured that ExpressVPN comes with a 30-day money-back guarantee so you can try it risk-free. Aside from offering high quality performance and excellent overall usability, ExpressVPN is secure. It uses 256-bit AES encryption to protect your data and also protects you from DNS leaks. Other key security features include split tunneling and a kill switch. Finally, ExpressVPN keeps no identifying logs, which means you can surf the web anonymously. Speaking of anonymity, ExpressVPN lets you pay for the service in Bitcoin. ExpressVPN is available on desktop (Windows, Mac, Linux), mobile (Android, iOS) and routers. Browser extensions are offered for Chrome and Firefox. BEST VPN FOR PBS:ExpressVPN is our top choice. It unblocks PBS as well as Netflix. Thousands of servers across 94 countries. User-friendly apps and strong security. Try it risk-free with the 30-day money-back guarantee. NordVPN boasts an impressive 5,343 servers at the time of writing, 1,864 of which are in the United States. Having so many servers to choose from means less server load and better performance. We’ve found NordVPN to be fast, consistent and excellent at unblocking geo-restricted content. Aside from unblocking PBS Video outside the US, NordVPN can also unblock Netflix, Amazon Prime Video and BBC iPlayer. One major selling point of NordVPN is that you can use it on up to six devices simultaneously. Furthermore, NordVPN’s apps are extremely responsive and easy to use. This is a VPN service that offers fast and efficient customer support, 24/7. We’ve tested this out for ourselves and found the customer care agents to be very knowledgeable. As for security, NordVPN uses 256-bit AES encryption, DNS leak protection, and a kill switch. This plus a no logs policy and the option to pay in cryptocurrencies makes NordVPN one of the safest VPNs. You can use NordVPN on Windows, Mac, Android, iOS, Linux, and Android TV. Chrome and Firefox browser extensions are also available. EXCELLENT VALUE OPTION:NordVPN has a huge network of servers in the US and worldwide. It’s fast and unblocks PBS and Netflix. Live chat support and a no logs policy. 30-day money-back guarantee. CyberGhost offers a combination of strong performance and security. It has a network of 3,555 servers, 678 of which are in the US. Aside from being able to unblock PBS, CyberGhost works well with US Netflix and Amazon Prime Video among others. Servers were fast in our testing with no noticeable dips in quality. This VPN service offers unlimited bandwidth and traffic and even lets you connect up to seven devices at a time. We’ve tried out the various CyberGhost apps and found them to be easy to use. Various settings can be toggled on and off, including an ad-blocker and data compression. Looking to CyberGhost’s security offering, it uses 256-bit AES encryption and provides protection from DNS and IP leaks. There’s also a handy kill switch feature and a strict no logs policy to protect your privacy. In terms of apps, CyberGhost is available on Windows, Mac, Android, iOS, Amazon Fire Stick and Android TV. You can also download browser extensions for Chrome and Firefox. However, manual configuration is required with Linux and routers. STRONG SECURITY:CyberGhost has a large network of servers and works with PBS. Use it on up to 7 devices. Secure with encryption and no logs policy. 30-day money-back guarantee. IPVanish is a United States-based VPN service and is therefore well-placed to unlock PBS. It has approximately 1,200 servers, around half of which are located in the USA. These US-based servers are spread across nearly 20 different cities including Chicago, Los Angeles, and New York. We’ve found IPVanish to be a fast and reliable service that successfully unblocks streaming services such as BBC iPlayer, Amazon Prime Video and HBO Go. A standout feature of IPVanish is the availability of up to 10 simultaneous connections. This is far more than most VPN providers allow and makes IPVanish a great option for families. Aside from easy-to-use apps, 24/7 live chat, and email support, IPVanish has all of the key security features expected of a quality VPN. That includes 256-bit AES encryption, DNS and IPv6 leak protection, a kill switch, and zero-logs policy. IPVanish apps are available for the following: Windows, Mac, Android, iOS and Fire TV. Manual setup is needed for Linux and routers. IDEAL FOR FAMILIES:IPVanish has plenty of servers in the US. Watch PBS and connect up to 10 devices simultaneously. Secured with encryption. 7-day money-back guarantee. PrivateVPN is a VPN service that unblocks most geo-restricted content you’re likely to come across, including PBS. Although it has a smaller network of around 100 servers, these are in 59 countries, including the US. PrivateVPN has servers in 9 US cities and we’ve found them to be very fast for browsing and streaming. Aside from PBS, PrivateVPN unblocks Netflix and Amazon Prime Video and we didn’t encounter any performance issues such as buffering or lag. You can have up to 6 simultaneous connections via a single PrivateVPN account, allowing you to secure all of your devices. The PrivateVPN apps are really simple to use, though customer support is available should you need it. PrivateVPN states it doesn’t use freelance support reps — only the PrivateVPN developers themselves. We’ve found it to be a secure VPN service with a no logs policy, 256-bit AES encryption, DNS leak protection and a kill switch. PrivateVPN offers user-friendly apps for Windows, Android, Mac and iOS. Some manual setup is needed for both Linux and routers. FAST SERVERS:PrivateVPN has very fast servers for streaming PBS and Netflix. It’s user-friendly and secure with encryption, kill switch, and no logs policy. 30-day money-back guarantee. Can I use a free VPN to watch PBS outside the US? While you can probably use a free VPN to watch PBS outside the US, we strongly advise against it. One of the main reasons is that most free VPNs are too slow for streaming. The high number of users and limited number of servers means you’ll encounter a lot of buffering and lag. Although a free VPN might unblock PBS and PBS Kids, it likely won’t work with other streaming services that use anti-VPN measures such as Netflix. Free VPNs are often very limited in terms of features. This is particularly critical when it comes to security. After all, a VPN should not only unblock geo-restricted content, but protect your online privacy. Many free VPNs don’t use encryption or offer a kill switch. What’s more, many free VPNs log your data and activity and sell it to the highest bidder. As we’re finding out with the likes of Facebook and Google, free is rarely ever free, particularly when it comes to our online privacy. What can I watch on PBS? 13 Can I use a free VPN to watch PBS outside the US? 14 What can I watch on PBS? 15 What is PBS Kids? 8 Can I use a free VPN to watch PBS outside the US? 9 What can I watch on PBS? 10 What is PBS Kids?